What did Sports Afield think of our videos? If you found yourself in a wilderness survival situation, would you be prepared? You will be if you watch this award-winning video series featuring wilderness survival instructor "Doc" Ron Hood, a veteran of the U.S. Army Special Warfare Teams. Of course, good credentials don’t make a good survival instructor-good information does. 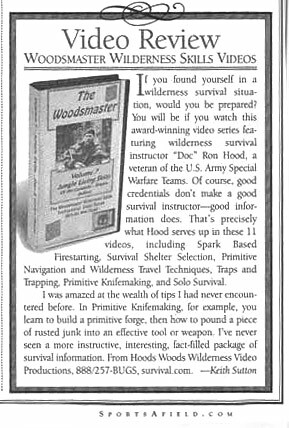 That’s precisely what Hood serves up in these 11 videos including Spark Based Fire starting, Survival Shelter Selection, Primitive Navigation and Wilderness Travel Techniques, Traps and Trapping, Primitive Knife making, and Solo Survival.